MSE graduate student Parag Banerjee has won the 2009 Presidential Student Award from Microscopy Society of America. He will receive the award at the MSA's Microscopy & Microanalysis 2009 Meeting this July in Richmond. Banerjee received the award for his paper, "Crystallization Behavior of HfO2 Nanotubes in Different Environments." The paper describes how nanotubes of amorphous hafnium oxide crystallize when heated under various conditions of mechanical stress and temperature. Samples were generated in the Laboratory for Advanced Materials Processing and the Maryland NanoCenter's Nanoscale Imaging Spectroscopy and Properties Laboratory (NISP) Transmission Electron Microscopy (TEM) facilities. By studying the formation of tiny crystals in these nanotubes, Banerjee hopes to shed light on fundamental atomic rearrangements that occur in nanostructures during crystallization. The award is based on the quality of the paper, and the student must be the first author. Banerjee will personally present his paper at the meeting. Banerjee is advised by Gary Rubloff (MSE/ISR), the Minta Martin Professor of Engineering and director of the Maryland NanoCenter. Rubloff also is an affiliate of the Institute for Research in Electronics and Applied Physics, the Fischell Department of Bioengineering, and the Department of Electrical and Computer Engineering. 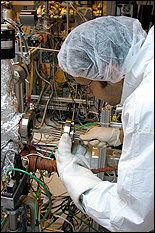 Banerjee's overall research concentrates on energy harvesting and energy storage devices using conventional semiconductor processes as well as self-assembled techniques for nano-fabrication. Energy harvesting devices include but are not limited to solar cells. Energy storage devices include but are not limited to supercapacitors and batteries. If these devices are going to be commercialized, they need to be integrated with the current processes available. At the same time the devices need to be cheap. These varied process requirements mean that one has to be creative in one's approach and yet come up with devices that possess improved performance characteristics. Banerjee is a native of Chandigarh, India. He started his Ph.D. studies at the University of Maryland in Fall 2006.